Microbank™ is a ready-to-use system designed to simplify the storage and retrieval of bacterial and fungal cultures. It is comprised of a unique cryovial system incorporating treated beads and a special cryopreservative solution. Microbank™ provides a more reliable means of maintaining important cultures than repetitive subculture, which can result in contaminated cultures, lost organisms or changed characteristics. The specially formulated preservative ensures longer survival of fastidious cultures and higher quantitative recoveries. Microbank™ is available in five colour-coded styles, offering microbiologists the flexibility to colour-code different species or strains of bacteria. Each vial contains approximately 25 beads, providing repeated cultures of the original organism using a simple procedure. The standard presentation of Microbank™ is 80 vials supplied in a freezer box manufactured from durable plastic with a “see through” lid, number locator printed screen and tube collection device. Microbank Dry is supplied in the same format as traditional Microbank™ without the specially formulated cryopreservative solution. A minimum order quantity may apply to selected colours where applicable. A 20 well, insulated cryoblock is available which enables the operator to remove a number of Microbank™ vials from the freezer for sub culture without risk of the culture beads defrosting. The cryoblock is insulated with a polystyrene shield. Freezer storage boxes are available, which are suitable for collection and organization in low temperature freezers. 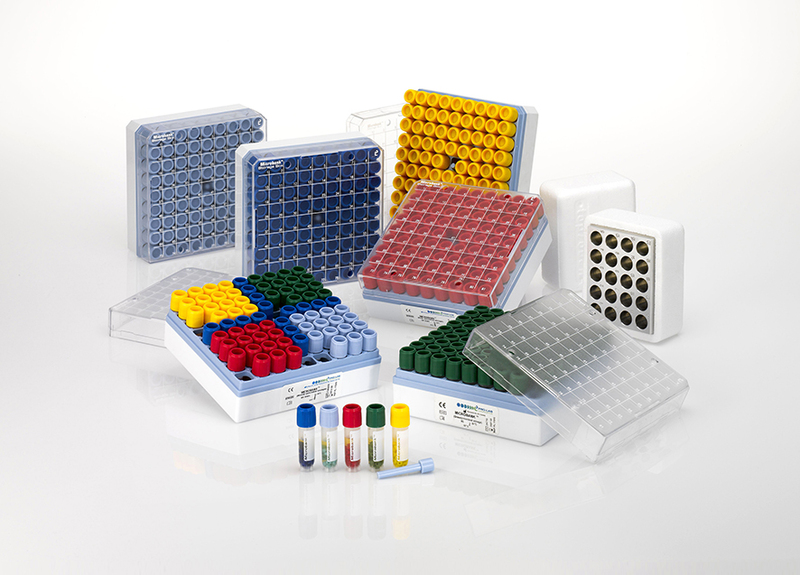 Available in blue or red, each freezer box will hold up to 81 Microbank™ vials. Manufactured from durable plastic with “see through” lids, number locator printed screen, and tube collection device.